Truck drivers in Queensland have been forced to a standstill due to devastating floods, with Premier Anna Bligh declaring 75 percent of the state a disaster zone. Bligh declared disaster situations for Toowoomba, the Lockyer Valley, Brisbane, Gladstone, Ipswich, the Sunshine Coast and Rockhampton. Disaster situations have also been declared for Dalby, the Gold Coast, Warwick, Bundaberg, Gympie, Logan, Maryborough, Roma and Redcliffe. The Managing Director of Toowoomba-based Simon National Carriers, David Simon, says there are about 40 trucks stuck on the Toowoomba range because roads have been closed. Queensland Transport officers and local trucking operators are handing out food and drink to drivers. Simon says a local hotel is also giving drivers a place to shower. "There’s no indication of when the Toowoomba range will be open," he says. "The Queensland Transport guys deserve a mention." A Warwick resident and wife of a truck driver who spoke to ATN says flooding has forced drivers to park their rigs. "If you look around Warwick every truck is grounded. There’s nowhere to go," she says. Trucking owner and the Queensland delegate of the National Road Freighters Association (NRFA), Anthony Hopkins, was part of a Coles "mercy dash" to get supplies to Rockhampton before the floods isolated towns. He made it as far as Chinchilla before rising waters forced him to stop. Hopkins expects to be stuck there for at least three to four days. "They were trying to get as much groceries into the town as possible," he says. Bligh says disaster declarations give emergency officers the power to evacuate people to save lives and property. Flash flooding swept through Toowoomba and the Lockyer Valley on Monday, killing 10 people and leaving 79 unaccounted for. 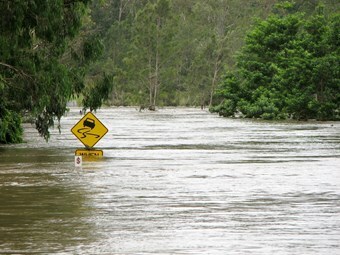 Floods had already torn through the northwest and central parts of Queensland, inundating homes and businesses. Brisbane is preparing for floods to peak at 5.5 metres by Thursday, exceeding the damaging 1974 floods that killed 14 people. "This flood event continues to develop and change at a frightening pace," Bligh says. "Now is not a time for panic, it is a time for us to stick together, to reach out to each other, and to listen to the advice from our emergency workers." Her comments come as counselling teams descend on Toowoomba and the Lockyer Valley to support residents affected by the floods. "Queenslanders have lost loved-ones and have been through traumatic and frightening experiences. Some are anxiously awaiting news of loved-ones," Bligh says. All tolls have been lifted on the Gateway and Logan motorways to allow people to get home as quickly and safely as possible. "With dozens of roads in the city flooded we want as many people out of the centre and back home safely," Main Roads Minister Craig Wallace says. Public transport in the southeast corner ceased at 1pm to keep roads clear for emergency services and road repair crews. "We have the best engineers working round the clock conducting bridge and road inspections to see if they're safe for travel," Wallace says. The Queensland Trucking Association (QTA) has been called upon to assist the Government’s flood recovery efforts, with QTA CEO Peter Garske providing advice on road repair and freight priorities. Hopkins says many in the trucking industry have been doing it tough the last couple of years and the floods will only add to their problems. "We’re going to have a tough time. All of us are going to hurt," he says.